Oh geez... can you imagine all the kids who are now gonna try to "look cool" as they emulate the Comedian lighting up his cigar like this? 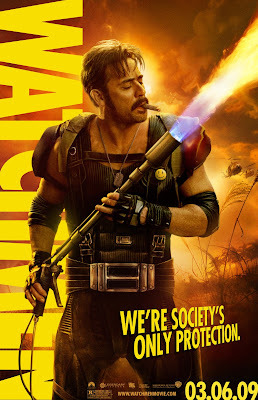 Ain't It Cool News has collected the links to the six new character posters just released for Watchmen. Also in the lot are Rorschach posing with his grapple-gun, Laurie/Silk Spectre II, Dr. Manhattan (in a scene that everyone who's read the book will recognize), Adrian at his Antarctic retreat (with Bubastis in the background! ), and Daniel with the Owlship. Hey Chris, have you seen the new picture of the Enterprise from J.J. Abrams' Star Trek? oops...I should probably give a link to the picture which I had meant to do before hiting the publish comment button. D'OH! Yeah, I heard about it. I also read about the 20 minutes of footage they showed in the UK. I can't wait to see the trailer for it that's suppose to be attached to Quantum of Solace on Monday, when Paramount officially releases it online.